Students and their directors arrived at the hall before 10 am, when rehearsals began. The young singers spent the majority of the day singing together as a mass choir on the stage of Laura Turner Hall. Each choir prepared a selection of movements from Carl Orff’s Carmina Burana for the mass choir rehearsals and performance. 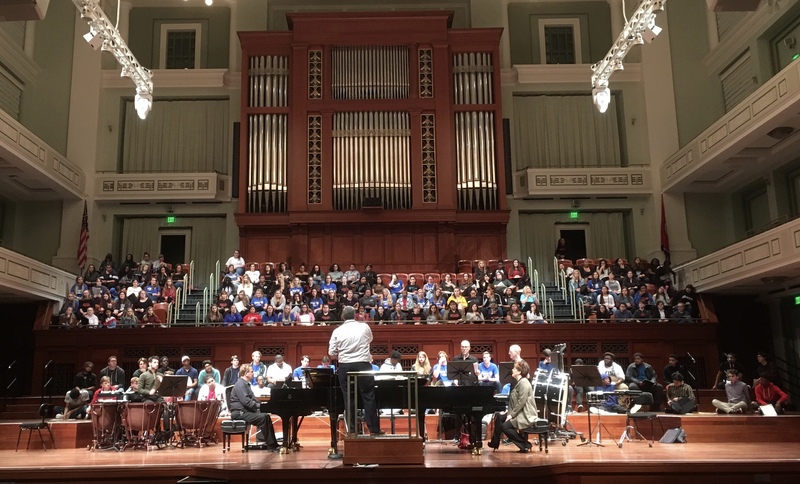 The Nashville Symphony is preparing for very special upcoming performances of Carmina Burana May 31 – June 3, and repertoire for this year’s youth choral festival was chosen to give student participants an immersive introduction to this beloved classical standard, a “sneak peak” at the music of an exciting upcoming symphony performance, and the rare opportunity to rehearse and perform at Schermerhorn Symphony Center with Nashville Symphony musicians. Dr. Tucker Biddlecombe warms up Festival choristers at 10 am on Monday morning before they take their places on stage. 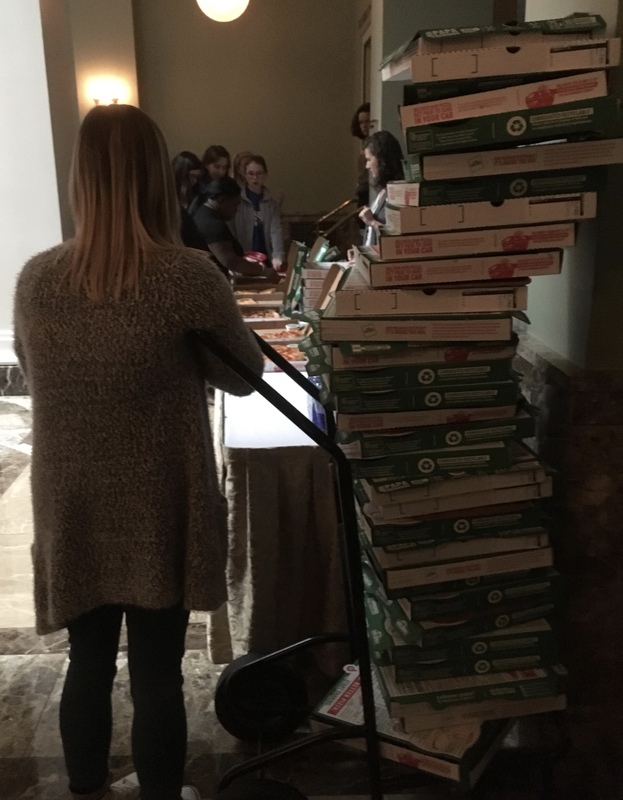 How much pizza does it take to feed six choirs? 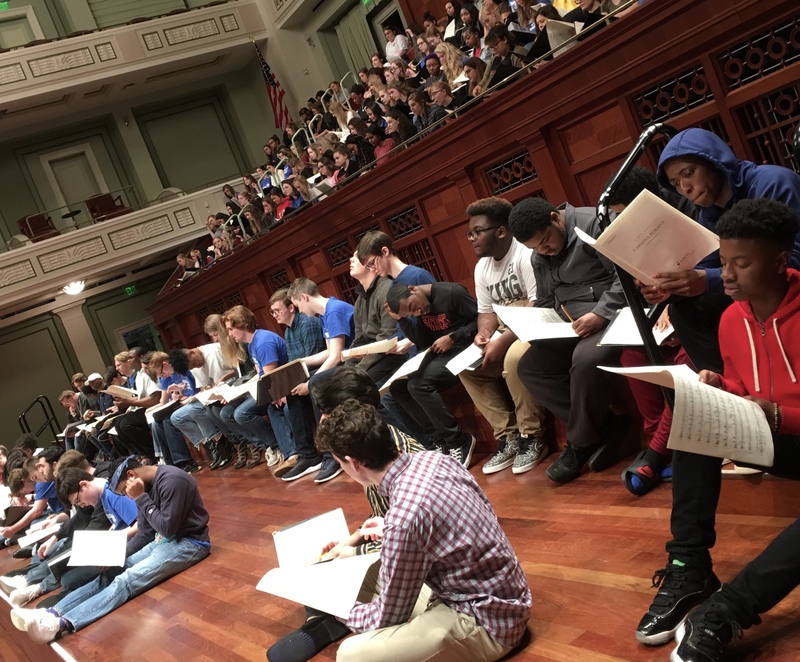 After a busy morning of rehearsals, students ate staggered pizza lunches in the East Lobby while their peers held sectional rehearsals on stage, then returned to the stage for a final mass choir rehearsal with a robust ensemble featuring Nashville Symphony musicians that included duo pianos, timpani, and four other percussionists. Following this “dress rehearsal”, each high school choir rehearsed blocking for the evening performance, performed their individual selection for Dr. Biddlecombe in clinic format in front of their peers from the other choirs, and changed into concert attire. 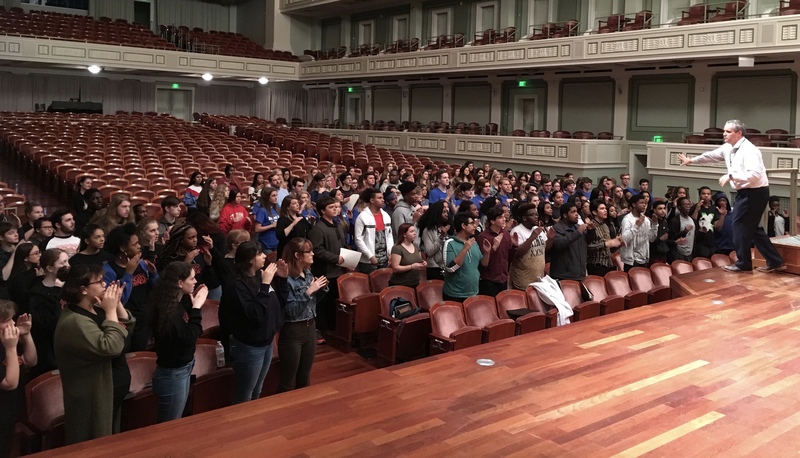 Once afternoon clinics were complete and everyone was dressed for the concert, the Vanderbilt Chorale took their places on stage. This ensemble – which Dr. Biddlecombe also directs – gave a brief performance consisting of contrasting, virtuosic pieces and answered questions from the high school singers about the experience of studying music at the college level. Finally parents and friends arrived for the closing performance of the festival! All seven choirs performed first individually, and then assembled to sing the selections from Carmina Burana as one mass ensemble. It was a rousing end to an inspiring day of beautiful music-making. 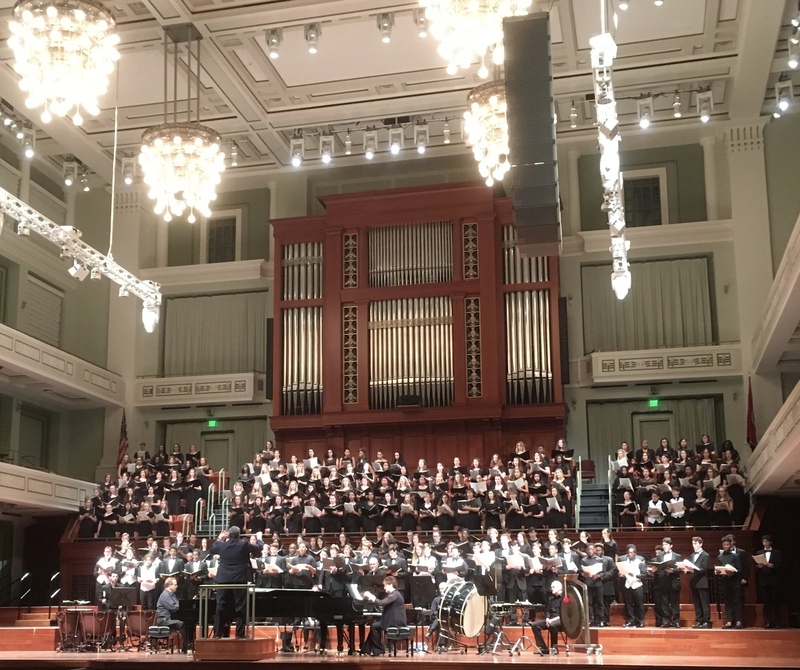 By walterbitner in Choral, Choral Music in Nashville, Education, Music Education, Nashville Symphony, Nashville Symphony Programs on March 26, 2019 .